A day out fishing with my cousin Andy for pike in Canada. On January 14th we set our alarms for 4am so we can get out on the ice early, once the morning came we got our stuff together an packed, than we were off. As the new year came around the corner and the temperatures started to drop and get colder. I contacted my cousin Andy to see if he wanted to go try fishing for pike on the weekend, the weather was from -15 to -26 for the weekend but without the wind it wasn’t too bad. Punching holes in the ice and all set up by sunrise, as the morning went on we started to feel the wind coming in and the temperature dropped to about -28 which almost felt liken -30. the wind was blowing through out the whole morning we have seen a dozen perch down our holes that seemed to be good sizes, Than all a sudden they just scattered and disappeared. At that time my cousin put down his under water camera so we can see what scared off the perch. Looking around for about 2 min we can see this big Northern Pike swimming around our hooks deciding which one to take. Too my left was my cousins girl friend who was looking at the camera screen to see if anything was around us. than Bang! 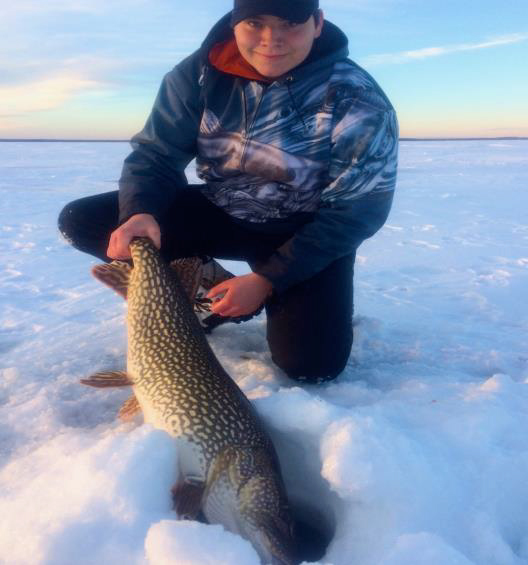 The Pike hit her hook, as we were bring it up from under the ice we can see the head pop up but than once he swung his head and rolled we missed him. We wanted to see how it would work. So we through one down our holes to see what would happen. Watching the bait cloud bubble up at the bottom on the ice. Once the bait cloud dissolved we can here a bell go off that we attached to our tip up go off. My cousin and I quickly ran out of the tent seeing that one of the flags were up. My cousin grabbed the line , set the hook and the fish was on! Bringing the Pike up from the hole. Few hours passed by so I went to go check my tip ups that were outside the tent, I reset the position the herring I was using by putting it 3-4 inches above the bottom. 5pm came around so we all started to pack up and loaded everything into the truck. As we were packing up I can hear this ringing in the distance but it was hard to hear because the wind was blowing and I remembered that my cousins daughter had a bell in her pocket that kept ringing so I thought it was that. I shook my head and laughed because it got a few times by hearing it ring and looking out the window to see if any of the flags were up. But it kept ring, and ringing so I turned around and seen a flag up. I rushed to my tip up and set the hook, I can tell it was a big fish because of how heavy it was. My cousin came around the tent an seen me pulling line from the tip up and asked “ you got a fish on?”, I said “yeah it’s a nice one!”. 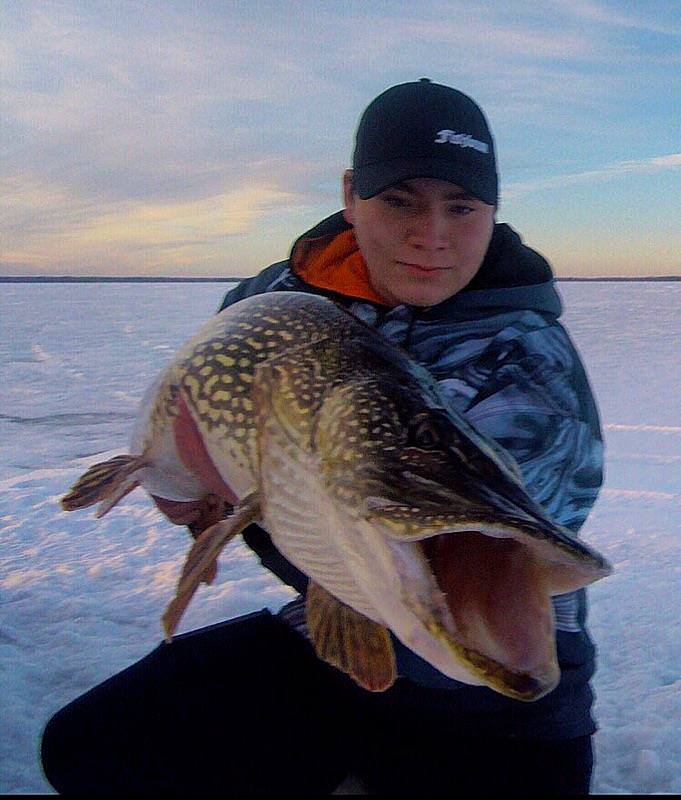 Pulling and pulling we seen the head below the ice and I couldn’t believe what I saw, a big’ol Northern Pike! My cousin Andy grabbed the Pike for me and unhooked the hooks that were in the mouth. We brought the Musky Bumper Fat boy to see how many inches it is. When I seen this Pike touch the 41” mark on the Musky bumper I couldn’t believe it! I estimated the pounds on it and figured it would be 21.2lbs. My new Personal best Northern Gator! It was the happiest moment of fishing I’ve ever had. After getting the measurements I got a few photos with the big Northern Pie. I don’t think I have ever smiled so much before. 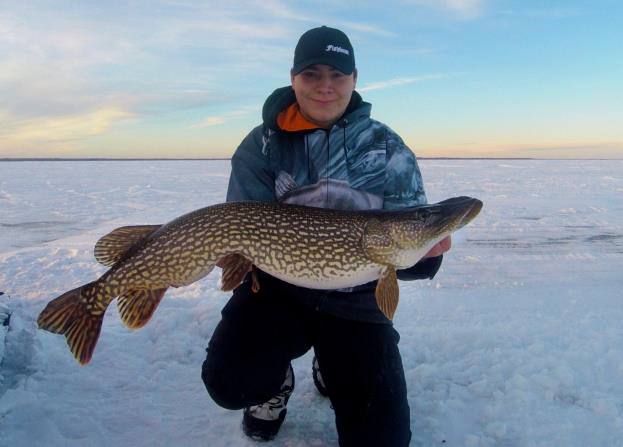 When releasing the Pike she still had power in her and took off fast back where she belong under the ice. One day some one else will hook into her and release her. Big thanks to my cousin Andy for assisting on my PB Northern Pike. Follow Cody's adventures in Wild Society App, download it now!